There is no telling what will end up on this page. The themes represented here are meant solely to tweak your children's imagination and encourage them to write. 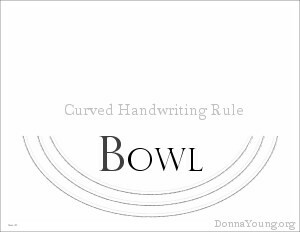 The handwriting rules will vary and some files might be available with and without handwriting rule. I had an idea today and this paper is the result. I hope this whimsical style encourages writing and drawing. The rule is approximately 1/4 inch, but it seems larger because the top is open. 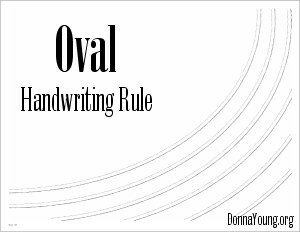 After making the Oval rule above, I decided to make one more. This one is "Bowl." I made this for Michelle, one of my online friends, a few years ago. The file is CROPPED. That means you have choices. In Page Scale under Page Handling, which should show up when you press the Print button, choose NONE to print the image small. To print it larger, choose FIT TO PRINTABLE AREA. When printing [horizontal] landscape oriented files, make certain that Auto Rotate and Center is checked. Before deciding on NONE, look at the representative image and the file size. The treasure map, set at None + Auto Rotate and Center, prints approximately 9.8 x 6.6. If that size is good, then print. If you want the file to print even smaller, select Fit to Printable Area and uncheck Auto Rotate and Center. If you want the file to print as large as possible, choose Fit to Printable Area + Auto Rotate and Center. Note:	The	settings that you choose will stick for the next printing job, so be sure to review them each time. Most of the handwriting lesson sets at donnayoung.org have handwriting paper to match the set. Linked below are the pages with the lessons and the handwriting file. Four Lesson Paper You can type one line per lesson group on this pdf form.